Tall Bearded Historic Iris "MARBLED MOHR" or is it a Arilbred???? If I had to pick an Iris which epitomised my year it has to be Marbled Mohr. It kinda is one type of Iris but it ain't, and lets face it, when you see such beauty the politics of Iris registration takes a definite back seat. Maybe, it just is one of those situations when,"If it looks like a Arilbred,Grows like an Arilbred, you know, it just might be an Arilbred"
Problems like these in Iris Nomenclature will be eliminated when the meaning of 'Cumulative" is discovered and embraced by more than just the few Iris Societies that have already done so. Then I have a William Mohr seedling I have kept around a long time because it always performs well. This I have named MARBLED MOHR. It is in the same color-range as SPLASHES but unlike it an easy grower. It carries a fine plicata heritage and I can see its use in a worthy plicata program. MARBLED MOHR* (Tell Muhlestein). Early-Midseason. 40 inches. (William Mohr.) X (47-15 ((Midwest x Mme. Louis Aureau) x (Aldura)). 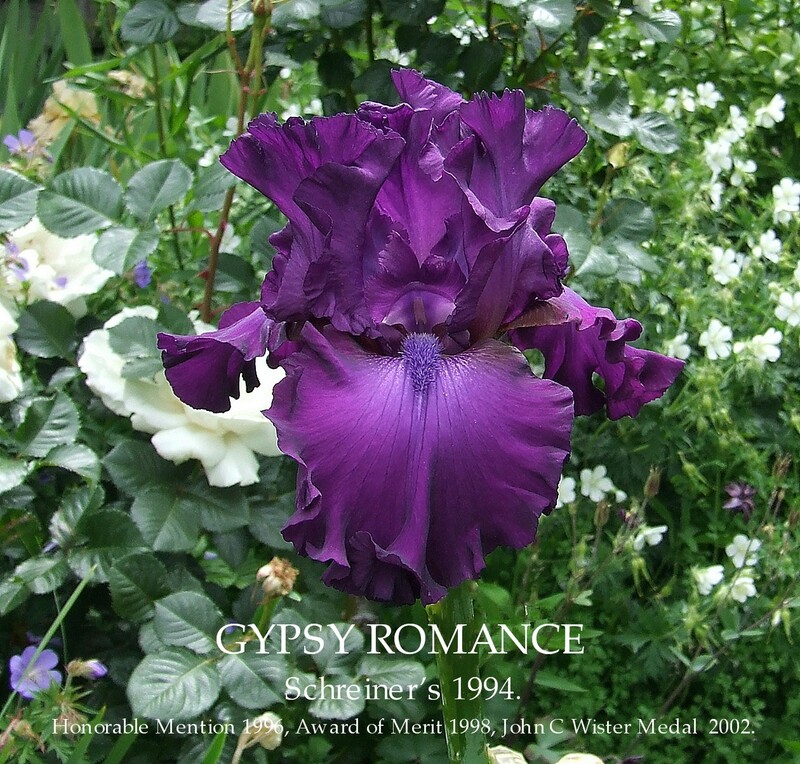 Its registered as a Tall Bearded Iris yet the 1959 American Iris Society (AIS) Checklist notes it as a "Mohr Type". MARBLED MOHR (Muhlestein, R. 1958). TB 40" E-M. V2M. Medium violet, splashed white (Mohr type). William Mohr x (Midwest x Madame Louis Aureau) x Aldura)., Tell 1959. The Aril Society International (ASI) in its 2006 Checklist notes Marbled Mohr under APPENDIX C "OTHER THAN" [OT] Iris which have been registered with the American Iris Society as "other than" arilbreds. They usually contain 1/4 aril complement. The Historic Iris Preservation Society has a Comprehensive Checklist of Aril and Arilbred Cultivars: This is an alphabetical checklist of cultivars based on American Iris Society registrations through 1996 and Aril Society International records through 1996. It contains historical information and notes on the cultivars in addition to "standard" checklist information. Compiled by Kay Nelson Keppel and Sharon McAllister.A great example of what a Cumulative Checklist can do and its listing is thus. MARBLED MOHR AB (Tell Muhlestein, R. 1958). Sdlg # N/A. TB, 40", E-M. William Mohr x ((Midwest x Madame Louis Aureau) x Aldura). Medium violet splashed white. Tell, 1959. Notes: registered as a TB but qualifies as an OB- in both systems. Ref: AIS '59, p. 122; ASI '76, p.53. Available in New Zealand from The Iris Garden so be sure to get your order in. See you all in the New Year and thanks for visiting in 2009. A visit to Eddie Johns and his Otara Birch Gardens is always one of the great highlight of the Iris year. 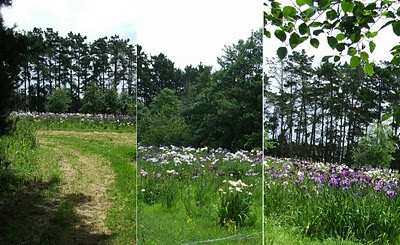 This is the largest collection of Japanese Irises in New Zealand and makes for an impressive display. Some of his new seedlings show real potential. A few of the photos taken yesterday. Big hat tip to Eddie Johns for his hospitality. We have grown this iris at home for two years, but only bloomed in its second season. My initial thoughts were before checking the label that it was most likely Bernard Hamner's 1994 introduction 'Burgundy Party' and what was it doing growing there? But when reading the label and double checking my notes and garden map, I found out the Iris to be the widely acknowledged shy blooming New Zealand bred iris 'Kingston Glory'. With good closed form in it's Standards, a nice amount of ruffling on both the standards and the falls, and with a not to excessive amount of veining extending from the haft down a significant third of the falls, giving 'Kingston Glory' a retro look of sorts. It's a soft bi-tone of burgundy-lilac colours which are sun-fast. Foliage has a purple bottom to it (PBF). All and all, a better looking and a more structurally sound bloom than 'Burgundy Party', but lets itself down by being an sporadic bloomer a trait that happens a lot with the progeny of 'Bewilderbeast'. Branching inconsistent and bud count is lacking so far, but I will continue to grow this iris with interest and hope it looses interest in been shy. KINGSTON GLORY (Noel Lapham, R. 2003). Sdlg. 98-86x. TB, 32" (80 cm), M. S. light rosy lavender; F. deep velvety rosy wine red, white ground at haft with rosy wine red markings; beards gold; lightly ruffled; slight fragrance. Honky Tonk Blues X Bewilderbeast. Begg Shield 2001. Mossburn Iris Gardens 2003. GYPSY ROMANCE (Schreiner 1994) is a rich deep cranberry, deeper and larger than ‘Thriller’ (Schreiner) with much improved plant habits. The hafts are imprinted with a small portion of smooth chocolate. Stalks are a superb modified candelabra, with 4 branches, double budded, with excellent sequencing of bloom and later secondary stalks, further extending its bloom season. Overall form is tighter and improved over the Schreiners’ 1992 offering of similar nature, ‘Mulberry Punch’. GYPSY ROMANCE Schreiner, Reg. 1994 Sdlg. W 603-1. TB, 37" (94 cm), ML ; Ruffled violet raspberry (RHS 77A), hafts washed bronze; beards blue purple. R 720-D: (Louisiana Lace x Entourage) X T 879-B: (L556-1: (G 510-A x Fabulous Frills) x Starcrest). Schreiner 1994. HM 1996, AM 1998, Wister 2002. Formerly widespread in its Native habitat the plant is now classified as Vulnerable.